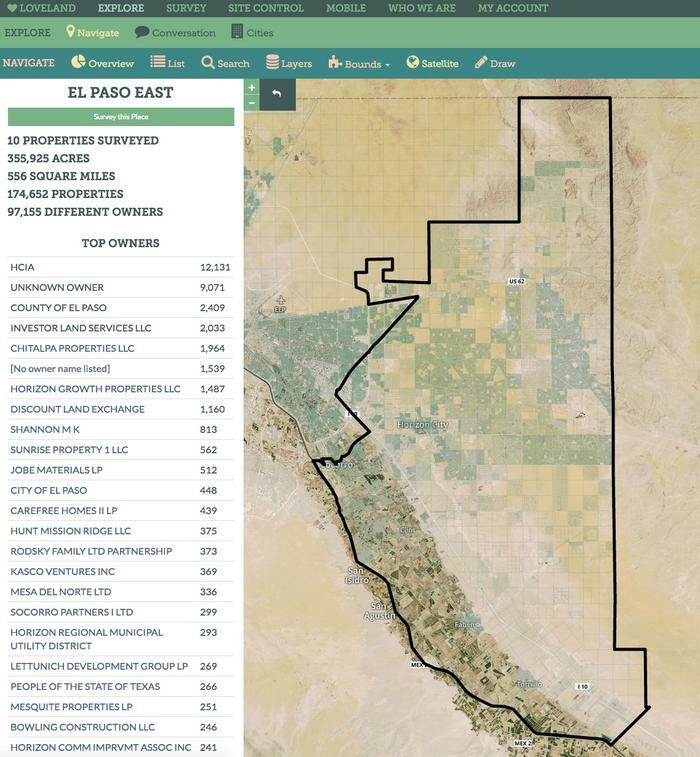 Scanning some parcel data for El Paso County, Texas (a newer edition to the LOVELAND explorer), I noticed a lot of subdivisions with larger parcels around them. When I turned on the satellite view I thought we had some bad data for a moment: thousands of subdivided parcels in the middle of the desert. Not only are there parcels with no structures, but sometimes no actual roads underneath, just the outlines of roads which should be there based on the parcels themselves. That is when I discovered the cautionary tale of real estate investment gone wrong. It turns out these desert parcels are no accident but instead spearheaded by a devious real estate corporation of the 1960’s. The company was called Horizon Corp., and back between 1962 through 1975 it “was one of the largest sellers of undeveloped land in the Southwest” ( El Paso Times, 2011). Unfortunately for those who purchased plots of land from Horizon Corp. in the middle of undeveloped Texas desert, there would never be any development of utilities like water, electricity and roads. People from all over the world encountered extremely aggressive salesmen from Horizon Corp., the kind who likely would sell you two encyclopedia sets, the second just to get them to leave. If this were not enough, it turns out those who own the parcels of land are now stuck with them due to a Texas law attempting to solve a different issue. The Colonia Act of 1994 makes the selling of properties impossible if they do not contain water and utilities. Worthy of further investigation for a later story, Colonias are an issue in Texas, as they are developments primarily along the Mexican-American border that have substandard services and utilities, are often in floodplains or other undesirable lands, and have homes constructed by the residents themselves with haphazard building materials. Though this was never the intention of the subdivisions of Horizon, the parcels of land nevertheless fit the criteria since they are without utilities. Using the LOVELAND explorer tool enables entities like the Horizon Communities Improvement Association to further plan how to handle these properties. As the homeowner association of the area, they have assembled properties from owners in order to offer larger lots to developers to actually develop the land as habitable properties. Regardless of what becomes the fate of the Horizon City area, it is fascinating to view these desert ghost parcels of El Paso and discover other parcel mysteries in America.